Tell us how your ‘Lakshmi Talk Show’ happened? I came to India during the engagement of Vishnu. At that time Vishnu was producing a TV serial called ‘Happy Days’ on Zee Telugu channel. I had always wanted to host a talk show and when I pitched this idea to Zee Telugu, they liked it. I went back to USA and returned for the wedding of Vishnu. And Zee Telugu insisted that we should launch the show as soon as possible. My ultimate dream had always been to create a bridge between India and USA. My roots are in India and my struggles are there in USA. I wanted to create a bicultural career for myself and I feel that this is the perfect time to do so. What is the content of Lakshmi Talk Show? It will be a mixture between Oprah Winfrey, Ellen DeGeneres, Tyra Banks, Rendezvous with Simi Grewal and Koffee with Karan. There will be a tip of the week at the beginning of each show. And we will invite the guru in that field as the first guest. There will be two celebrities (mostly from films to start with) sitting down and talking with me. I tried to being the other side of celebrity in my shows. There will be another section called ‘face of the voice’. There are lots of talented singers. We know their voices and names, but we had never seen them how they look like. This section is aimed to bring them into the limelight. I want my program to be the champion of underdogs and to popularize the people with real talent. Tell us about the people behind your talk show? We have chosen red and black as the theme of the set and the set was designed by Murali who worked for a few films. Deepa Chander (Arundhati fame) is the stylist for me. Salim Sulaiman who composed music for Rendezvous with Simi Grewal and Koffee with Karan composed music for my show. Gnanam who handled the camera for KBC and Filmfare awards is handling camera and lights for my show. Venkatesan is the online editor. Vishnu Manchu directed the first six episodes of this show. It is going to be one hour show. How are you going to present yourself in show? I try to be myself on the show. There is no façade in my appearance. The guests for the first episode were Mohan Babu, Vishnu and Manoj. They never appeared together for any talk show in the past. It was the idea of my mentor Richard Lawson to get actors in family together for an episode. Vishnu and Manoj shy away from Mohan Babu all the time. How did you manage them? Vishnu was a sport. Being a brat, Manoj asked for money. Dad was the easiest to convince. Who is your best friend in film industry? Prakash (son of K Raghavendra Rao) is my best friend. I call him anna. Whenever I have something to share, he is the first person to call. And he gives his feedback frankly. Manoj is also my best friend. My other friends in film industry include Manjula, Sumanth, RaNa and Bunny. What is your take on your last production venture Nenu Meeku Telusa (NMT)? The entire team has done a fantastic job. My father always says that we should work hard and the results (hit or flop) depend on the fate. Manoj took so much of risk which no other actor would take. For the kind of work he did in NMT, he got four projects (one each with Chandra Sekhar Yeleti, Veeru Potla and K Raghavendra Rao). After watching the film K Raghavendra Rao came to our house and waited for my father for an hour. K Raghavendra Rao directed landmark films with my father. It’s been 5-6 years since my brothers entered the film industry. For the first time he got confidence about Manoj’s ability after watching NMT. NMT did to Manoj what other films like Donga Dongadi, Sree and Raju Bhai failed to do. Are you not disappointed with the financial outcome of the movie? There is a saying in Ayurveda that it takes 42 repetitions for it to be effective. NMT is one of the very few repetitions in Telugu film industry. It takes few many different films for industry to make such films work. Which is the film you liked the most in recent times? Arundhati. It has blown me away. Shyam Prasad Reddy is a producer who is producing films not by choice, but by compulsion. That is why we are getting such powerful films like Arundhati. Who is good – Vishnu or Manoj? Both of them are like my two eyes. How can I select one among them? I am what I am because of my family. But me and Manoj always belong to one party. Vishnu is my career advisor and Manoj is like my life coach. Who is a better actor – Vishnu or Manoj? I am a better actor than both of them (giggles). Both of them are creating their own style. Vishnu is concentrating on doing commercial films where as Manoj is doing hatke movies. They have hidden talent. Their real talent is not exploited so far. Which is the best film among the ones done by your brothers? I feel that Manoj has done very good job with Raju Bhai. I think that Salim will be the film for Vishnu. You should have a good director to exploit the acting. I saw clips of Prayanam and they are amazing. Even if I am 1% of what my father is in terms of discipline, punctuality, dedication, outspokenness and passion, I feel that I could become a fantastic human being. I learnt how to work hard and have fun at the same time from him. I always miss him when I am away from Hyderabad. As an actor, I like the way he takes risk. He is an actor first and a star second. I like his versatility in selection various types of characters. Tell us about your husband? He is my biggest fan and my best friend. We don’t have the regular societal husband-wife relationship. But we enjoy the best marital life any couple can have. Tell us about your pet dog Zeus? Zeus is very dear to me. I named him as Zeus Manchu Anand. 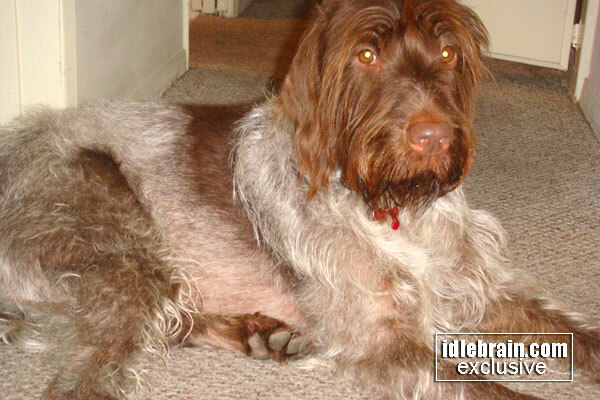 He is of wire-haired pointing griffon type. There are only 350-500 of such dogs in USA. My brothers too are fond of Zeus. Do you have any directorial ambitions? Yes. I plan to direct movies. One should know all the crafts to be a good director. I will not venture into direction till I am 100% confident. What are the secrets of your beauty and fitness? 2. Do Pranayama for 5 minutes everyday. 4. Yoga: It clears all the conflicts and drive away the negative energies. I am happy whenever I do yoga. I love all the films of Mani Ratnam and Amir Khar. I like most of the movies of Krishna Vamsi and Puri Jagan. I like out of box filmmakers like Gangaraju Gunnam. I love watching and working for films. Film is not just a work for me, it’s a passion. I love food and I am a food freak. I love Munakkai sambar, neyyi, kotha avakai, vadiyalu, anything to do with mangoes and chocolates. Yoga, Movies, Shopping, Food and Travel. Any new travel destinations in mind? I make it a point to visit a new place I had never gone before every year. This year I am planning for a Bali trip. Traveling new places make us wiser and more knowledgeable. I will be producing a film with Manoj as hero in the direction of K Raghavendra Rao. I will be acting in a film to be produced by Vishnu Manchu.